Enjoy the 3-Park SeaWorld, Aquatica and Busch Gardens Ticket for the price of the 2-Park SeaWorld and Busch Gardens Ticket!! 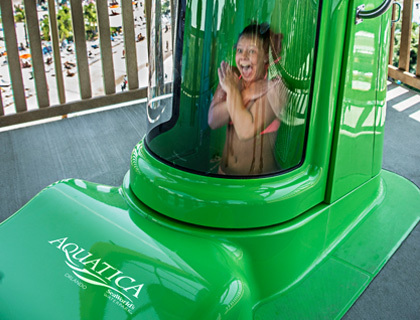 14 days unlimited admission to AquaticaTM, SeaWorld Orlando®, and Busch Gardens Tampa Bay. PLEASE NOTE: Waterparks are subject to close due to weather conditions without prior notice. FOR 2018 departures only: Your ticket entitles you to FREE parking on your first visit to either SeaWorld Orlando, Busch Gardens Tampa or Aquatica Orlando. When you receive your 3-Park Ticket (on your first visit to any of these parks) your ticket will automatically include unlimited free parking to all parks during its validity. To qualify, you must purchase either a 2018 3-Park SeaWorld, Aquatica & Busch Gardens Ticket or a Discovery Cove Ultimate Package for all members of your party. 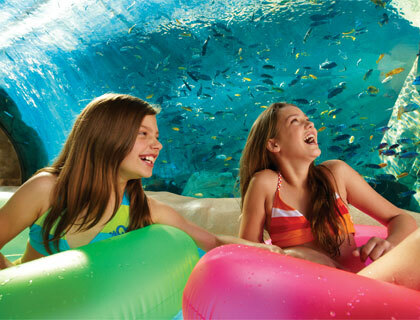 Enjoy 14 consecutive days of unlimited admission to SeaWorld and Aquatica. Ticket expires 14 days after first use. Tickets are valid in year of purchase only. Make huge savings in Orlando with our EXCLUSIVE freebie! For a limited time only, we're giving away a FREE Florida Packed Pass e-card with all key Florida parks bookings. 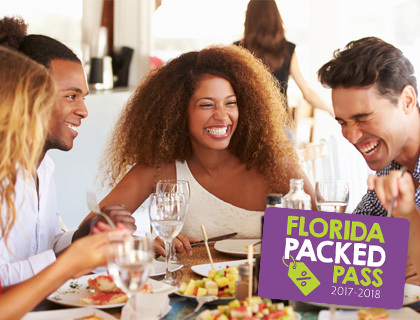 The Florida Packed Pass gives you massive savings on dining, shopping and activities at over 100 different venues in Florida! Our combo tickets are also included! T&C’s: Valid on all 2018 bookings. 1 card per booking.1 card is valid for up to 4 people only. Limited stock offer. Facilities at Aquatica include three food outlets, Banana Beach Cookout is a great value option, where you can purchase an all-you-care-to-eat pass for the day, shower facilities, free use of life-vests, plus locker, towel and cabana rental. It’s just across the street from SeaWorld, if you visit SeaWorld and Aquatica on the same day, you only pay for parking once. To make your experience at Aquatica more enjoyable, admission may be suspended on days of high attendance. Therefore, it's advisable to arrive before 10.00am or after 2.00pm in high season. 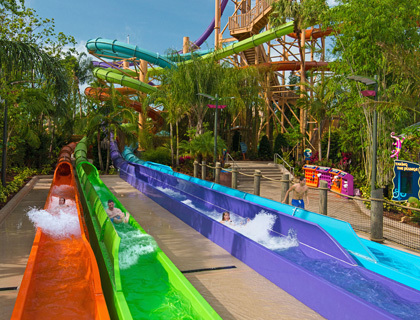 Check out our Orlando FlexTicket™ page for a great value way to enjoy a day at Aquatica and many other top Orlando attractions! Aquatica, SeaWorld's water park inspired by the exotic South Sea Islands, is unlike anything you'll have experienced before. 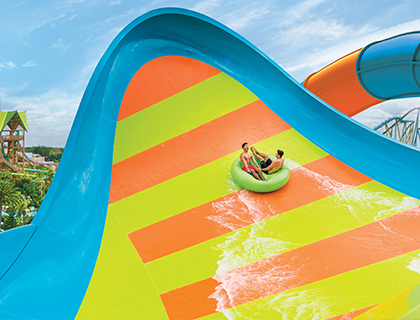 A clever combination of wild and wacky water rides, azure lagoons, aquatic animal attractions and pristine white sand beaches, Aquatica offers a full day of relaxation and fun for every family member. 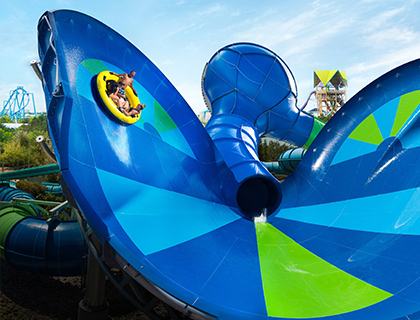 Unique attractions at Aquatica include Loggerhead Lane, a gentle raft-ride through coves, waterfalls and colourful shoals of exotic fish and Dolphin Plunge®, a crystal clear tube slide ride through a lagoon of playful and inquisitive Commerson dolphins. Ihu’s Breakaway Falls - the tallest, steepest and only multi-drop tower slide of its kind in Orlando – is now open at Aquatica water park. Riders climb 126 steps to the top of the eight-story tower, which stands at almost 80 feet tall, stepping into one of three ‘breakaway boxes’. As the door closes, riders cross their arms and give a thumbs up in preparation for their drop – but they’ll never know when the floor beneath them will disappear. Facing each other, thrill-seekers watch as their fellow riders fall. PLEASE NOTE - In order to make way for a new attraction at Aquatica, HooRoo Run will close permanently on 31 October 2017. To accommodate construction, Walhalla Wave will temporarily close on this date and re-open in spring 2018 alongside Ray Rush. NEW! Take a look at the All Day Dining ticket option below.